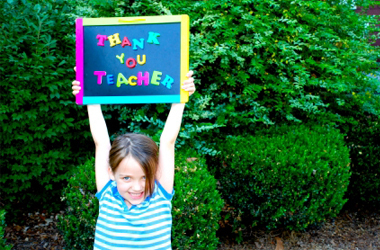 5thSeptember is a day of appreciation and celebration for all teachers. It’s Teacher’s Day! Teaching is a noble profession they say, but how is this profession perceived and what is its significance in our society? Anyone can be a mere teacher but what does it take to become a genuine, excelling teacher? This week’s writer reflects upon the role of a teacher in a student’s life, their own share of pressure and fears as well as their strengths. Teaching is a noble profession and the tragedy of it is that not everybody gets into this job because they chose to be a teacher. The fact is that majority of the teachers are there by chance and not by choice. Why is teaching a last option for many of the dynamic and intelligent class of job seekers? Is it because teaching is a lowly paid job, or is teaching a less challenging job? On top of that with every school clamoring for 100% result, teachers have a daunting task at hand. Teaching is something that you can do only if you have a passion for it. It has its own challenges and the thrill of going through these challenges is really very satisfying. Your relationship with the students determines your survival as a teacher. Your good rapport with them can bring the best out of you. But it is still your attachment to teaching and your intense passion for it that will see you as a good teacher. The place of a teacher in an evolving society has been debated over the years by intellectuals of the society. Teachers are indispensable and without them no society can grow. But with the emergence of mass media like internet, the role of the teacher has to a certain extent lost its importance. If the idea of teaching is to simply impart information, then the emergence of internet surely can diminish the importance of a teacher. Students can access information from internet and can rely less on teachers. If this is the real case, then teachers who teach non technical subjects can end up feeling less important. Sometimes ready answers given by a student because he has accessed the internet can be a little uncomfortable for a teacher even though the teacher is not supposed to feel so. But the fact is that the internet is easily accessible and there are students who are out there to test a teacher’s skill. For many of the teachers this can be a nightmarish experience, and therefore it becomes necessary for him to update himself in a very consistent manner. This might be a challenging task for a teacher. So what is the real role of a teacher, if the information that he is supposed to impart is already available and easily accessible to any student with one click of a mouse? A teacher always likes to teach something that is not known to the class. But if the information is already available with the students then he/she becomes like one who is only repeating what they already know. It can also happen that many of the school campus can become wifi zone in the near future where the students can freely use internet to get all the information they wants. So what exactly is the role of a teacher? Let’s contemplate about it and come up with an appropriate solution or answer. The answers can be different and solution varied. These are very subjective and the opinion given by one need not be accepted by another. Let us leave aside that standard role of a teacher that is given in every book. There are many articles on role of a teacher and all the articles are more or less the same. You have read them enough and these are readymade answers that anyone can easily give. Let us leave those aside and find out something new that makes a teacher a real teacher. There are teachers who can really inspire simply by their presence. I should call them the born teachers. That is not to undermine all those other teachers who picked up the skill of teaching in due course of their life like me. There are teachers who are very unassuming and short of lengthy speeches, yet they blend well with the students. They are charismatic in the sense that they are able to inspire and bring out the best in them. Being a shrewd observer he /she can identify the talent that is unique in a child. Without a teacher this uniqueness in a child will end up being locked inside for ever without even the child getting to know about it. The greatest obstacle a child faces is his lack of self confidence and his ignorance about what he/she can do the best. A teacher can be readily available for this task of igniting that fire from within the child that can awake him/her to a totally different world where he/she is face to face with his/her uniqueness. The fear disappears and out comes a completely new avatar. I don’t think any internet or mass media can help a child rediscover himself or herself without a teacher. In spite of all the information that a student gets from the internet, the presence of a teacher in the classroom makes all the difference. His towering presence and his movement within the classroom trying to reach out to all the students like a savior is just like life giving nectar to all the students present. It is just like he is there for them to turn to and seek enlightment. More than how much a teacher knows, it is very important how he delivers to the students about what he knows. Having said this, a real teacher is a teacher who makes his students comfortable and confident both in his presence and absence. Above all, the role of a teacher is not only to impart bookish knowledge but also to help them develop ethical values; to be a good human being which is the need of the hour in our society, inflicted with untold anti social elements. I believe there is a rapid rise in anti social element in the society because we are emphasizing more on materialistic possession and status and leaving aside the true essence of education which should help a person to become better human beings. At this present juncture, parents and teachers have an equal role to play in shaping and molding the younger generation with ethical values. Parents being the first teacher of a child cannot be ignored completely.